Whether you are looking to store baby clothes, winter clothing, or seasonal wardrobes, it’s very important that you know how to store clothes in a storage unit the proper way. It may seem as easy as packing boxes with clothing and loading them into your unit, but it’s a bit more complex than that. To maintain the quality of your clothing, you want to make sure it is stored properly. This involves choosing the right storage containers, the right storage unit, and taking steps to avoid moisture and pests from ruining your clothes. 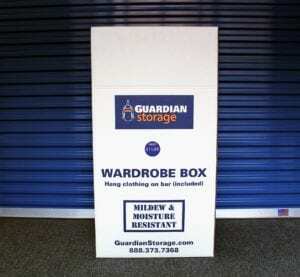 Below are the 9 most important tips for how to store clothes in a storage unit. Before you even begin to pack, you must make sure to wash all the clothing you want to store. This is crucial to maintaining the longevity of all the clothes you are storing. Unwashed clothing can produce, mold, mildew, and begin to smell if left long term. Even if your clothes don’t look or smell dirty, they may reveal stains over time. Residual perfumes, lotions, oil, or even sweat can sit in the fabric and turn your clothing yellow. Food stains or clothes that have been starched can attract pests, which will ruin your clothing. While you are getting ready to pack, you should go through your closet and decide what you want to keep and what you want to get rid of. Put aside anything you haven’t worn in the past 8 months. Why haven’t you worn it? Do you plan to wear it in the next 8 months? If not, it may be time to part ways with it. Set aside anything that doesn’t fit or has stains or rips. You can sell your clothing through yard sales or an app like eBay. Or, you may also choose to donate your clothes to an organization like Goodwill or Salvation Army for a tax write-off. Many people use cardboard boxes or plastic bags to store clothes, as these are more cost-effective options, but these methods leave your clothing vulnerable to damage. Plastic bags can trap moisture and will lead to mold and mildew. Free used boxes may seem appealing, but if they were previously used to hold food, they may contain bacteria or hidden pests. Cardboard boxes are also vulnerable to humidity and water damage. Instead, invest in plastic bins that snap shut to keep your clothing safe from all threats. These bins will keep your items safe from pests, water, humidity, and dust. Make sure to not overpack the bins, as there is no air flowing through to let your items breath. Opt for clear bins so that you can see the items inside. If your unit will be exposed to light, choose darker bins to avoid fading in your fabrics. Creating an inventory system is crucial to keeping you organized and allowing you to easily access items of clothing. There are a few options to choose from when deciding on an inventory system. For this inventory system, you will color code each box in your unit. Each color should be linked to a specific type of clothing whether it be divided by family members, season, or item type. Keep a sheet to refer to that will indicate which color coordinates with which items. With this system, you will label each box. Something like “Mom’s Winter Sweaters” will work well. This way, you can easily find the bin that has the item you are looking for. Make sure you are organized and specific while packing to help when you need to unpack. The inventory list is the most extensive option. It can be combined with the other two options and will help you be certain about where your items are. On this list, you will write down every item in your bin. You should list the item, a brief description of it, and the size of the article of clothing. This can be taped onto the bin or live in an excel spreadsheet. It will allow you to know for certain the contents of your bins so that you don’t waste time digging through them. Vacuum packing may save a lot of space, but it’s also very damaging to your clothing. Packing clothing this way long term can lead to permanent creasing and wrinkles. Natural fibers need to breathe, and by sucking all the air out of them, you are quickening the process of deterioration to your clothing. To avoid suffocating your items, lightly pack them into bins, keeping the heavier items on the bottom. Let’s be honest, mothballs smell awful. Luckily, they aren’t your only option when storing your clothing. Instead, throw some cedar chips in with your clothes to deter pests. They work just as well as mothballs, but without pesticides that can be harmful to your clothing. You can purchase them in either porous bags, or in larger blocks. Storing with a responsible storage company that practices preventative pest control and does not allow food storage is another way to avoid pests in your clothing. Store clothing in a dry, dark, and cool environment. If the environment is bright, the light can cause fading in your fabrics. 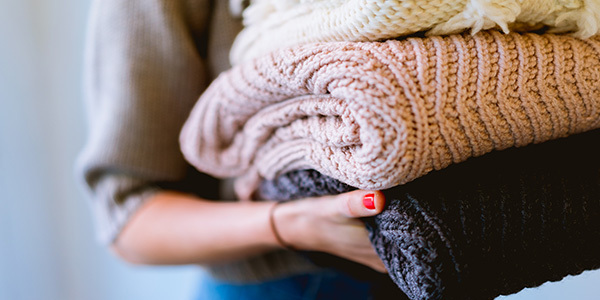 Many people choose to store their clothing in attics or garages, but these areas are susceptible to extreme temperature changes, which can damage clothing. Your best option will be a climate-controlled storage unit. Climate-control units are kept at consistent humidity and temperature, providing you with a perfect environment for long-term clothing storage. For more delicate clothing, invest in a wardrobe box to hang your clothing. You should always avoid metal hangers, as they can cause the fabric to stretch. They may also rust in humid environments or rip clothes with their sharp edges. Instead, invest in wooden or padded hangers for your clothing. Do not cover wardrobe boxes with plastic. Instead, cover with a cotton sheet to protect them from dust and light. If you will not be rotating your wardrobe, you should visit your unit every 1-2 years to refold your clothing. This helps prevent permanent creasing and will also allow you to check on your clothing. You can check and make sure there are no pests, dust, water damage, or stains developing. By following these 9 tips, you can feel confident that your clothing will stay in good condition while in storage. Now that you know how to store clothes in a storage unit, the next step is to decide on the storage unit that is right for you. Our blog has plenty of tips on unit sizes, the difference between climate and non-climate-controlled storage, and how to choose the right storage company. The best way to decide which unit is right for you is to stop by your local Guardian Storage, where our trained property manager will walk you through your options and help you get the right unit.